I like that little clunk-tank. It should work for you. I can't understand the issues with the wedge... I usually (pretty much always..) orient the engines' backplate horizontally on the firewall when running a wedge tank. 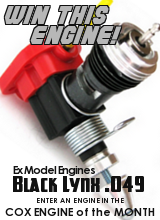 I realize that you can't do that with your current engine-mount. It's just a theory.. but your PT's fuel tank feeds straight-down.. and loops back up to its vertically-oriented backplate. Its fuel-line doesn't transition from horizontal to vertical.. and has no trouble using all the fuel. If you experience the same issue with your clunk-tank.. that could be the problem.. and switching to a balloon-tank may not help the situation. I could be wrong... so take that with a grain of salt. 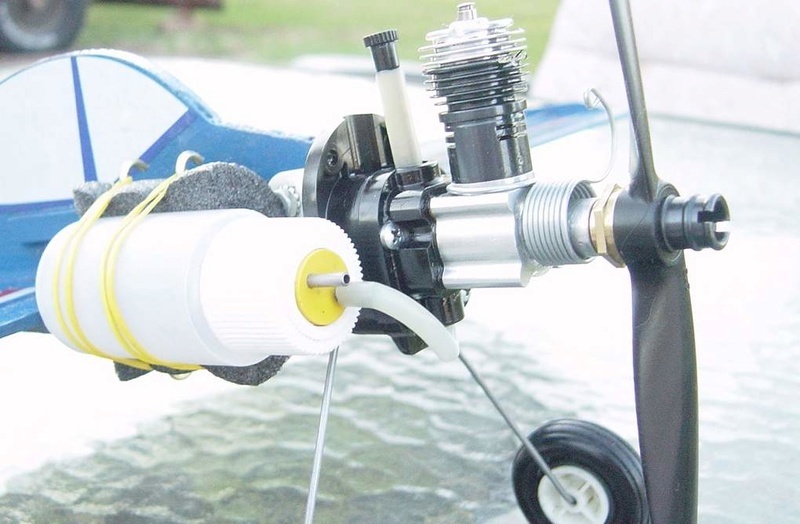 A "pressure-bladder" fuel-feed is another option.. but there's a couple of issues at play. 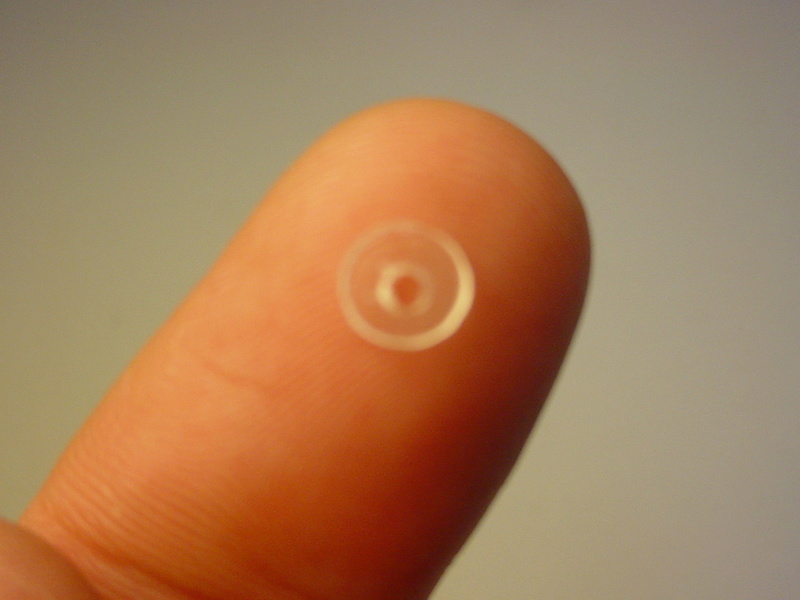 There's a learning-curve associated with their operation.. and they require a "fine-thread" needle-valve to work well. On the positive side; a pressure-bladder will feed the engine in any position. This is why most people use them rather than fussing with tanks. 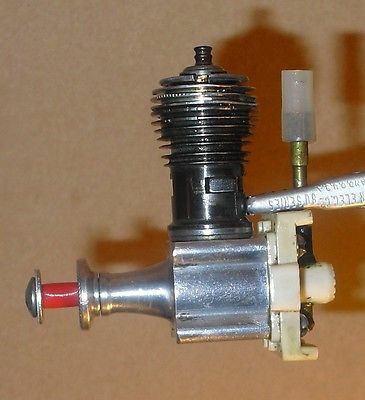 The older Cox .049 product-engines came with the fine-thread needle-valve assemblies. They were know as "postage-stamp" engines.. and had no mounts for use on a balsa model. Here's what the engine looks like. If you see one.. or just the backplate with needle.. grab it. Its fine-thread NVA can be swapped into the newer style backplate that you have, for running a pressure-bladder. 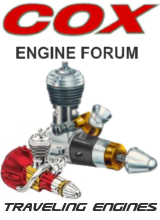 You may be better-off running an "integrally-tanked" engine like the "Silver Stunter" like you were considering before the build. Good luck.. I hope you get it figured out. 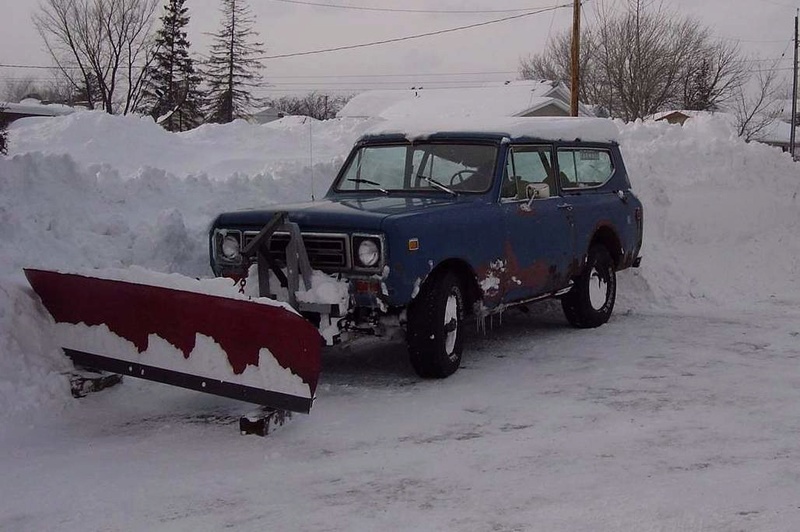 ...but, the 40 mph wind and 3 inches of snow we got on Friday kind of put the kibosh on that idea. It's about 33 degrees f here today and windy, so I guess I'll have to wait for better weather. Might happen about seven months from now. TLAnderson wrote: ...but, the 40 mph wind and 3 inches of snow we got on Friday kind of put the kibosh on that idea. It's about 33 degrees f here today and windy, so I guess I'll have to wait for better weather. Might happen about seven months from now. Hey, the plane looks fine just sitting there. Why mess it up by flying it? All you need are some skis... These were very easy to make. Aluminum "flashing" sheet, popsicle-sticks, a tiny pair of eye-screws.. double-sided foam tape, and some tubing for hubs. A piece of string tied to the eye-screws doesn't need to be an exact length. 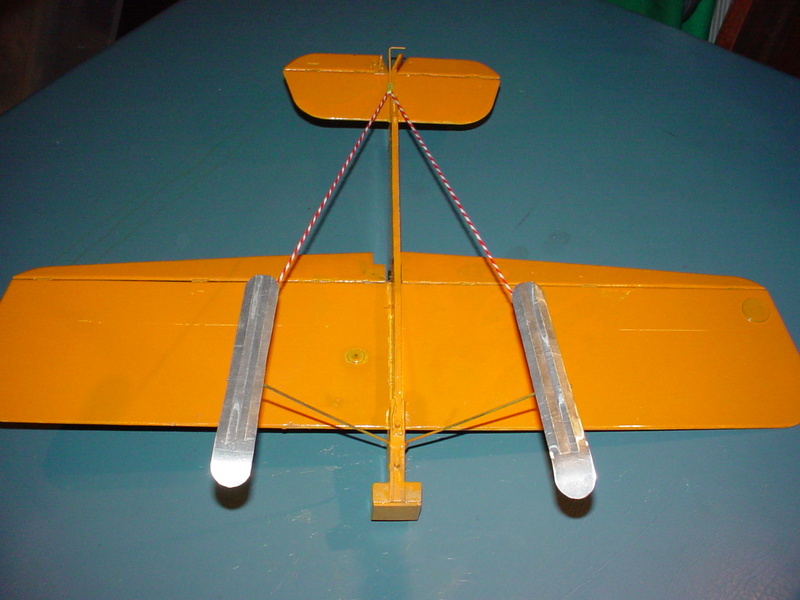 A rubber-band looped-around the string can be stretched over a tail-skid. Pretty cool skis, Roddie. Might have to make a set. I remember messing around with my .049s as a kid, when it was cold out. Prop strikes on cold fingers hurt! TLAnderson wrote: Pretty cool skis, Roddie. Might have to make a set. I remember messing around with my .049s as a kid, when it was cold out. Prop strikes on cold fingers hurt! Thanks for the compliment! Yes.. cold-weather flying is tough on the fingers. There's a few threads here on cold-weather flying. I haven't done a whole lot.. but one trick to getting your engine to start and run.. is to keep its' cylinder-head warm. This can be accomplished with the use of those "hand-warmers" that are sold for Winter activities. One of these placed in to a small zip-seal bag as a "hood" for placing over the cylinder would do the trick. 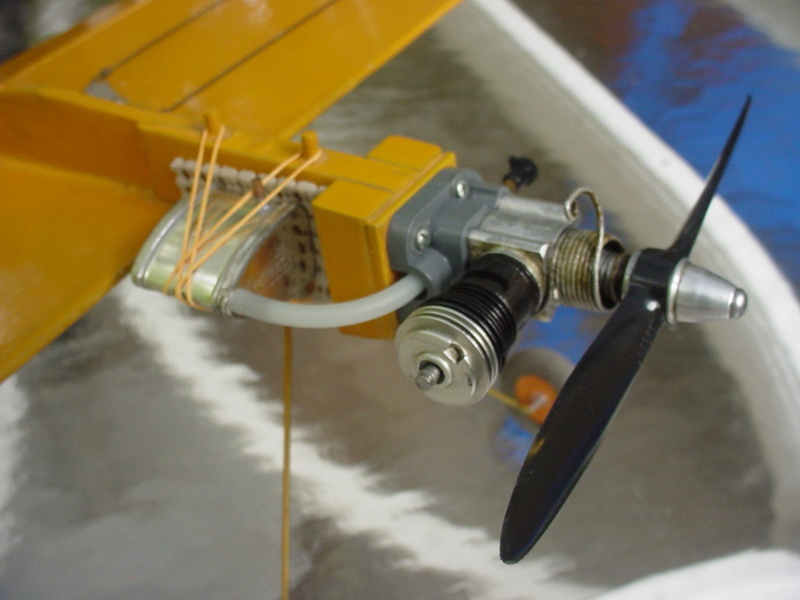 Some modelers claim that "yarn" wrapped-between the cooling-fins of the glow-head helps to keep it "HOT" when flying in cold weather. That makes perfect sense to me. Why not give it a try? 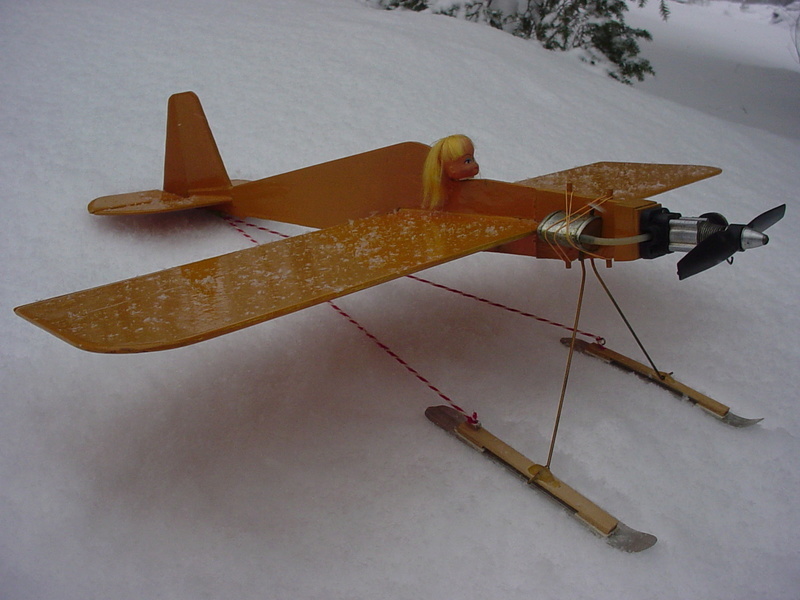 You may find that flying your models through the Winter-months is possible. Often there are beautifully clear and windless days in the Winter. I haven't ever flown on snow, but maybe on a sunny day in Massachusetts winter, I don't remember well. David Ingham wrote: I haven't ever flown on snow, but maybe on a sunny day in Massachusetts winter, I don't remember well. Did you live in Massachusetts David? I grew-up in Franklin, Mass. It's my hometown.. and I have family there. Franklin is in the South-Eastern part of the state.. roughly 30mi. South of Boston. I now live in Northern Rhode Island.. (N. Smithfield) which borders S.E. Massachusetts.. (Uxbridge/Millville) and is only 30 minutes (back-roads) from Franklin, MA. roddie wrote: Often there are beautifully clear and windless days in the Winter. Back when I was doing research, I worked for the University of Minnesota for one year and for MIT for bout three years. 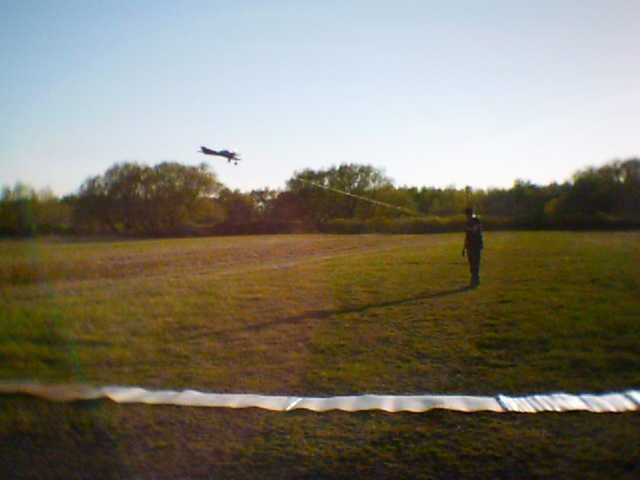 I lived in Ipswich and few with and joined a stunt control line club in Danvers. I bought my first PT 19 at a yard sale in Ipswich. If I hadn't spent the year in Minneapolis, I would have thought Massachusetts was cold. David Ingham wrote: Back when I was doing research, I worked for the University of Minnesota for one year and for MIT for bout three years. 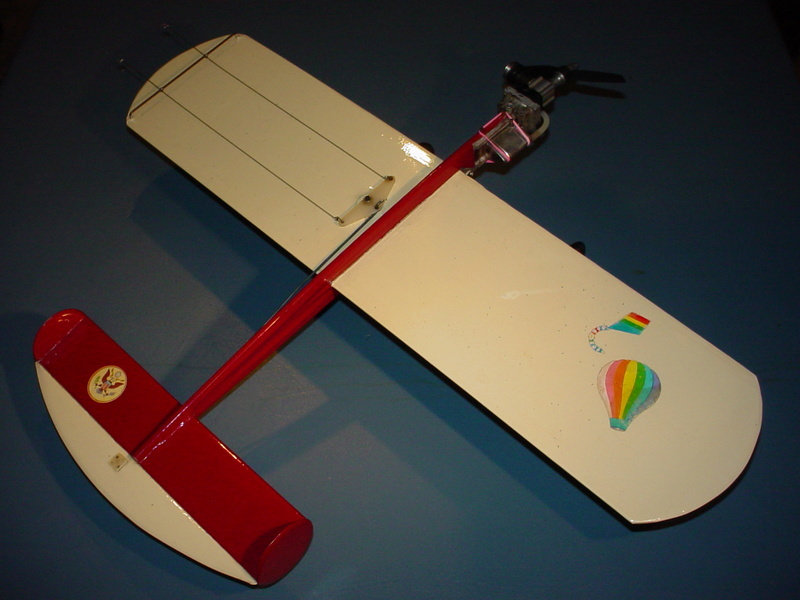 I lived in Ipswich and few with and joined a stunt control line club in Danvers. I bought my first PT 19 at a yard sale in Ipswich. -38° f is the coldest I've seen it since I've lived up here. I'm close to Lake Superior. The lake moderates the temperatures somewhat. Not far west of here, in Minnesota, the low hit -60° f one night, a few years ago. We get a little snow around here also. This is what I push it around with. Damn, Dudes, you Northeasterners and Midwesterners are made out of tough stuff. I admire how y'all tough it out through the winter only to be rewarded with a tease of summer. Skis on your planes, plows on your Jeeps, and wearing 20 pounds of clothes. RknRusty wrote: Damn, Dudes, you Northeasterners and Midwesterners are made out of tough stuff. I admire how y'all tough it out through the winter only to be rewarded with a tease of summer. Skis on your planes, plows on your Jeeps, and wearing 20 pounds of clothes. It's not bad enough "yet" to move down south Rusty! Lynne and I have lived here in the Northeast all our lives. 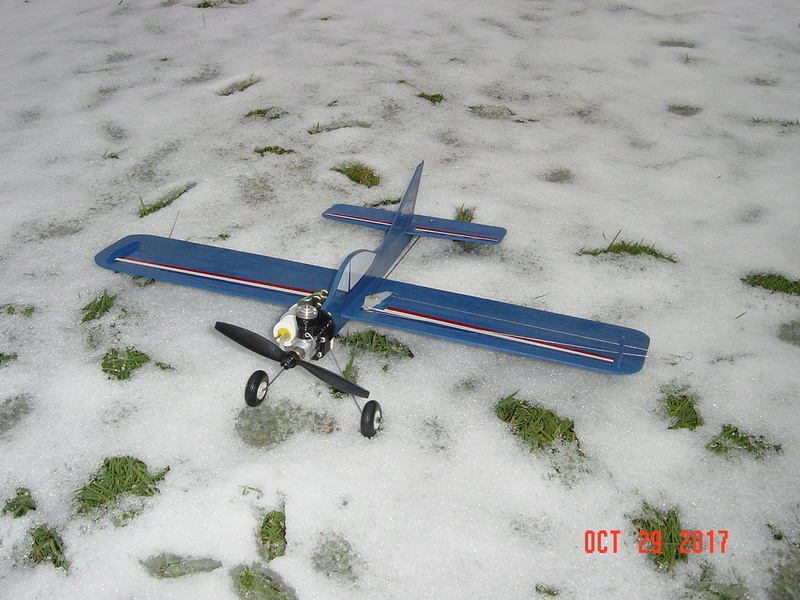 Getting a model-engine roaring when there's frost on the grass is exhilarating.. especially after your finger gets bitten by the propeller a few times.. and your ears start getting numb. 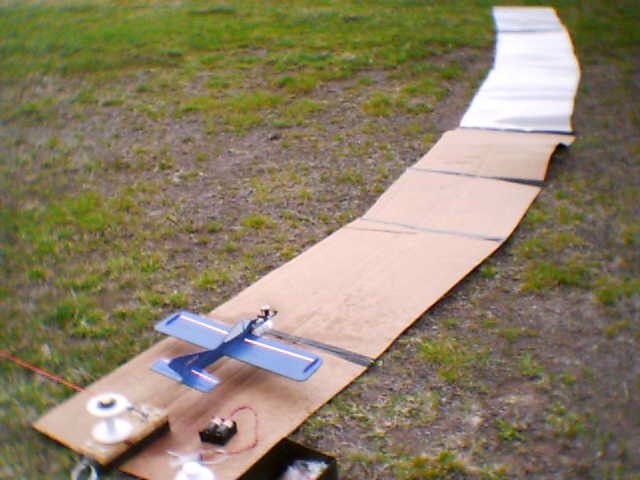 I want to try "Phil's" (pkrankow) method of wrapping a few turns of "sewing-yarn" between the cooling-fins of a Cox glow-head.. for when it gets really cold! 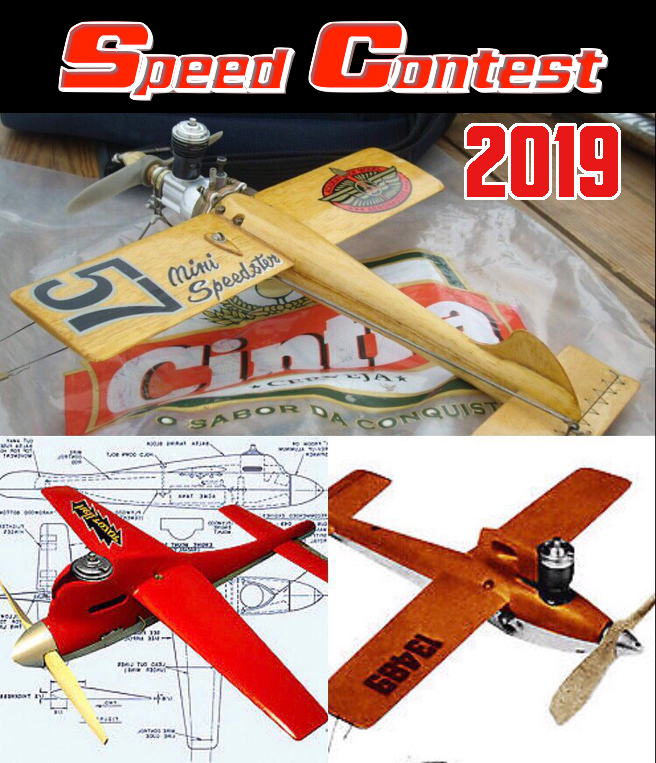 ...I want to try "Phil's" (pkrankow) method of wrapping a few turns of "sewing-yarn" between the cooling-fins of a Cox glow-head.. for when it gets really cold! I can promise you I'll never need to try that. While you're playing, I'll be sitting in front of a toasty fireplace in my living room, Lol. But I do pass it on to my cold weather friends when the discussion arises. RknRusty wrote: I'll be sitting in front of a toasty fireplace in my living room, Lol. But I do pass it on to my cold weather friends when the discussion arises. day to day stuff in the cold, kinda ........ . I was finally able to get some air time in last night. I was hoping that I had eliminated all the bugs by swapping the wedge tank out for the clunk tank. Not quite. A new one showed up. 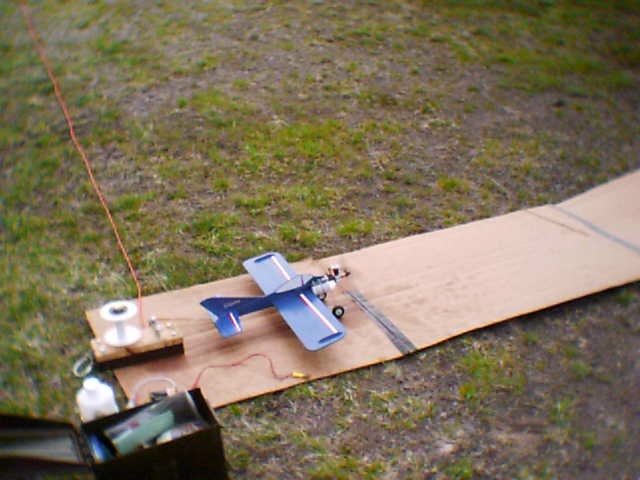 The first couple of flights, I was having an issue where the engine would start and run strong but then start losing rpm until it died. I looked it over while it was running on the ground, and saw that the needle valve was turning from the vibration. I remembered reading about that problem on this forum, and that the fix was to place some fuel tubing over the needle. I tried that, and it seemed to help. I was able to get a few full power flights in after that. 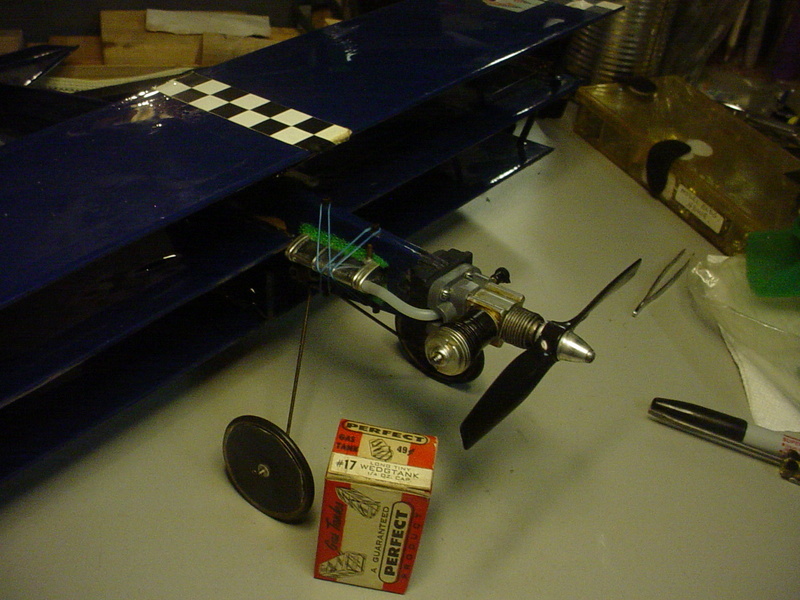 After I got home, I took the engine off the plane, and put a short piece of tubing over the needle seal, and another piece on the needle. I didn't have any washers small enough to fit the needle, so I made the tubing long enough to jam under the cap on the needle. Now we'll see if that works next time. So here's the current setup. Looks good. Should work well for you. I still have to replace my tubing over my needle valve as you did. Hey "TL"... Good to know that you're getting some flights in! I like your style; with the "stooge" and take-off runway-panels! I'm all about that! You can make a flat-washer to retain the silicone tubing on your needle-valve.. which will "stop" against the shoulder where the threads end. The diameter below that shoulder is .078". 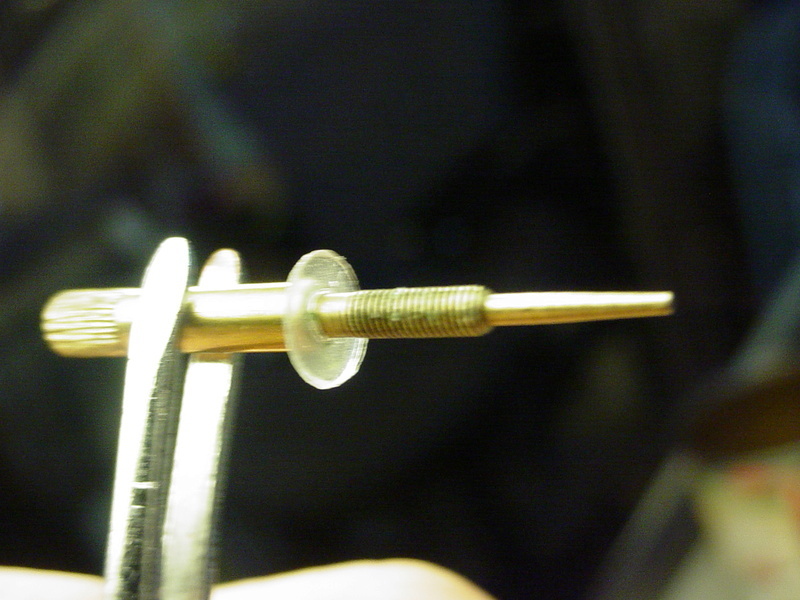 It's better to use a flat-washer here, rather than rely on the needles' plastic-knob to retain the tubing. Those knobs don't "stay-put" for too long. You will need a COMMON fractional-size 5/64" dia. twist-drill/bit (available at any U.S. hardware store) which measures .0781".. and "also" a standard hole-punch (1/4" diameter/plier-type for paper). 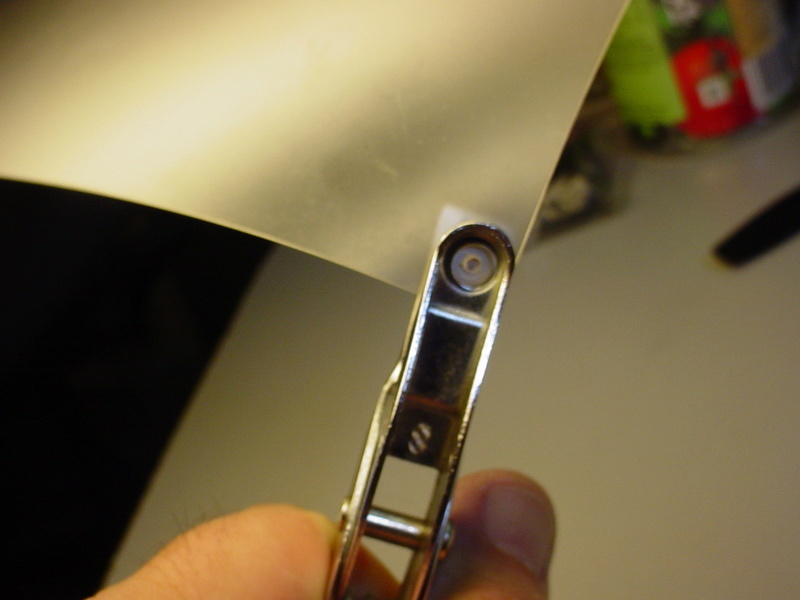 Try "punching" some plastic-sheet (such as "packaging-material" that would ordinarily be thrown away..) and use the "thickest" material that you can punch.. without too much effort. 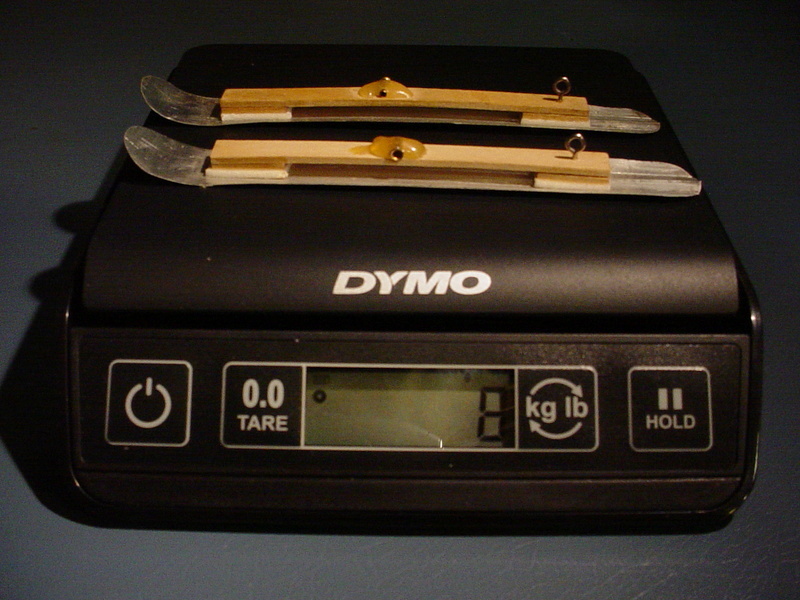 This will provide the strongest-stock for your flat-washer. It doesn't need to be steel. The washer's 1/4" diameter will "clear" the molded-area of the backplate.. where a larger-diameter (steel..) flat-washer might get stuck. If the hole-punch has a provision to capture the "punched-pieces".. 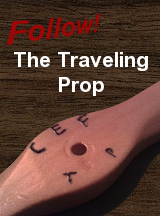 REMOVE IT; so that you can see-thru the "eye" of the punch to line-up/center the drilled-hole in the eye of the punch. Proceed to punch-out your flat-washer. NOTE: the punched-piece "may" pop-out of the punch and get lost.. so it's a good idea to drill a couple of holes, to make more than one. If none of them get lost.. you'll have spares for your needle-valve parts-bin. Here's some photos for a reference.. 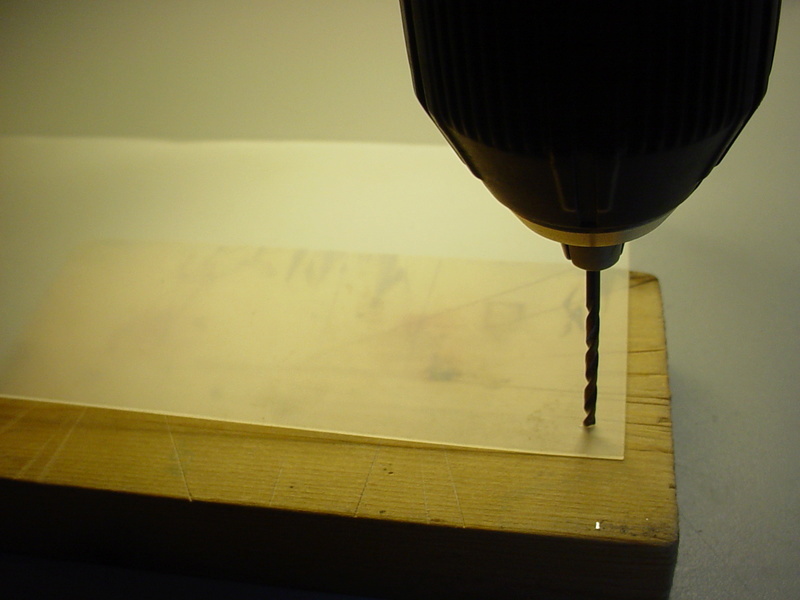 Drill a hole near the edge of your plastic material.. to be punched-out. sight-thru the eye of the punch.. to line-up/center the hole for punching.. 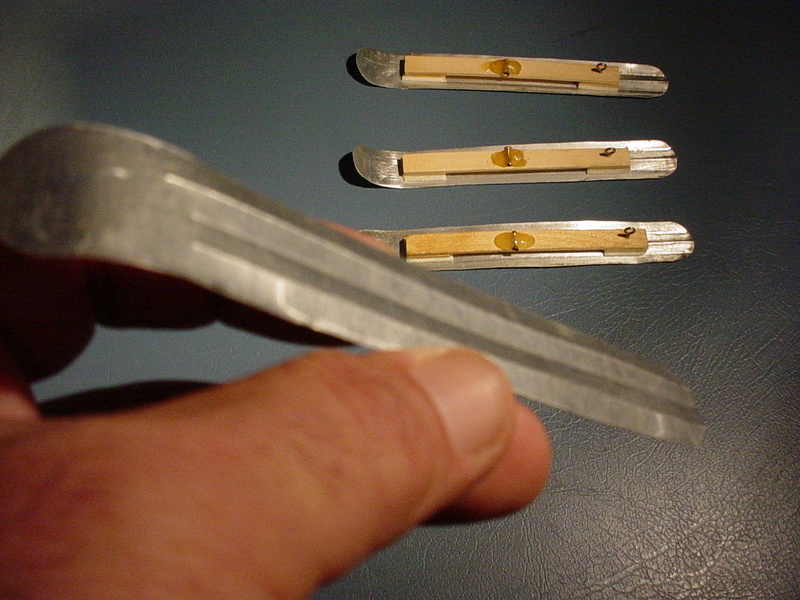 It's as easy as that.. to make your own flat-washers for small-diameter machine-screws. 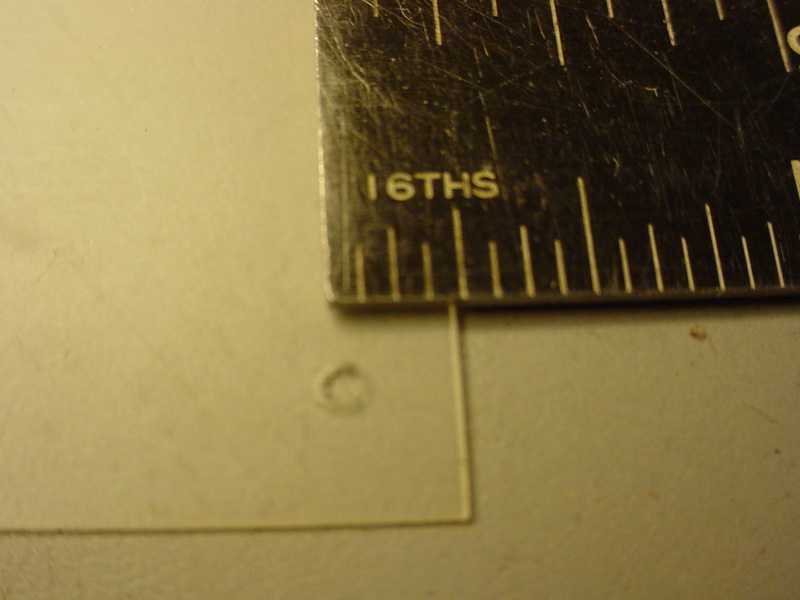 One "plus" is; making them from plastic makes them electrically non-conductive.. and also corrosion-resistant. roddie wrote: Hey "TL"... Good to know that you're getting some flights in! I like your style; with the "stooge" and take-off runway-panels! I'm all about that! Thanks Roddie. The stooge works pretty well. The runway panels are pretty much unnecessary for the skyray. It's off the ground by the second tape joint. The PT-19 uses the whole thing, and needs more. I'm tempted to strap a couple of model rocket engines to it for a little JATO action. Good info on making the washers. If the tubing solves the problem. I'll give that a try. 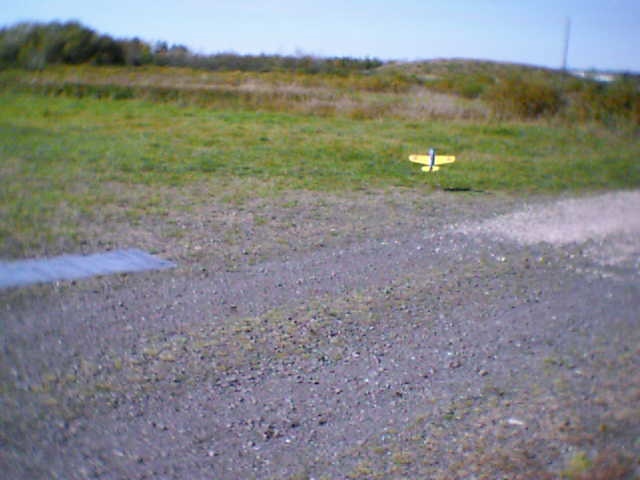 The season is so short up here, and good flying days so few and far between, that bug fixing, and troubleshooting seem to use up all the flying time. 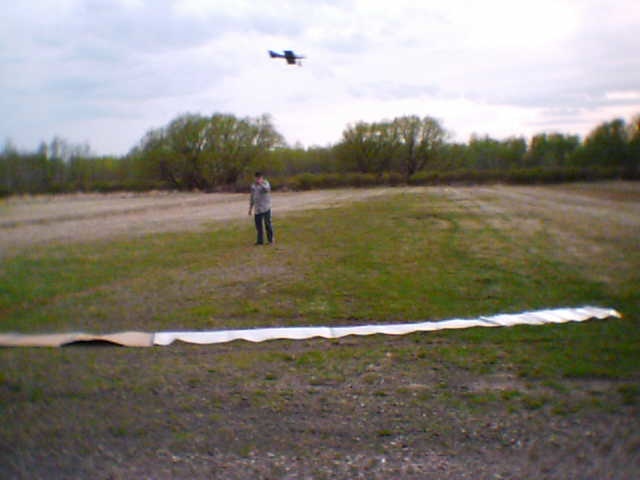 Hopefully, I'll get to the point soon, where I can just set up and fly without a lot of messing around. Here's some photos for a reference.. Drill a hole near the edge of your plastic material.. to be punched-out. Well, roddie to the rescue again! Darn roddie, you are just full of good ideas. I do agree that you should write a book. The only thing is now I wish I had screen shot all of your great ideas from the start. Got some more flights in tonight. The fuel tubing seemed to hold the needle from turning, and the engine ran ok. Man that thing is stubborn about starting the first time. After the first run, it will start on the first flip from then on. Anyway, it was a beautiful evening to get out and fly. Good for you! Nice pics. Thanks for sharing. Did you draft the photographer, or did (s)he volunteer? 944_Jim wrote: Good for you! Nice pics. Thanks for sharing. Thanks . The pics are captures from some videos that my wife shot.